Hi everyone! My name is Jewels. 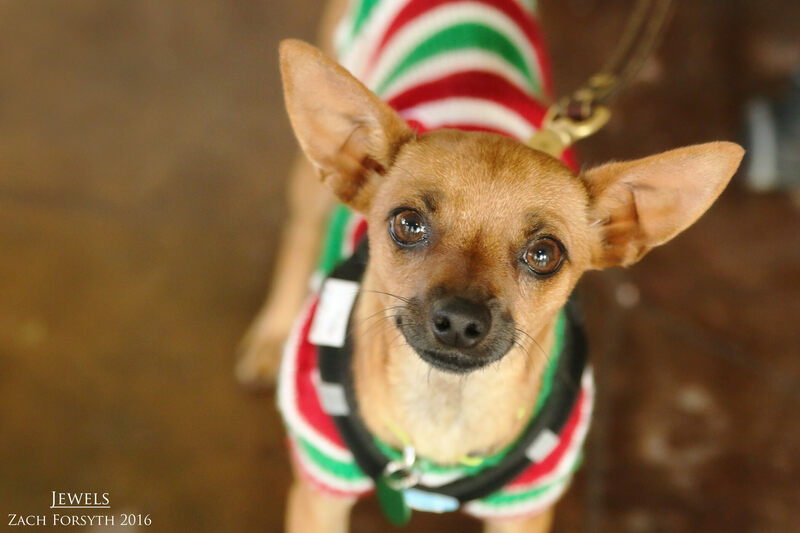 Maybe you heard of me, as I am a popular 2 year old Chihuahua pop star singing all of today’s pop hits!When I am not singing my way to the top of the carts, I love to snuggle with my humans friends over the age of 10. I enjoy playing with my other puppy pals and I am ok with those kitties as my background dancers too! The new city life is a little overwhelming for me and I would love to be in a quiet low-traffic neighborhood in a home owned by my adopters. Out of all the toys, I seem to love playing with those tiny squeaky balls the most. Though I haven’t quite figured out the game of fetch yet, but I am oh so willing to learn! Cute, cuddly, and did I mention cute?! Fill out an application today, so we can meet and I will give you a sneak peek to my new holiday hit, “All I want for the holidays is YOU!” I come to you spayed, vaccinated, and micro-chipped with an adoption fee of $300.